It won’t be news to you that online shopping is highly competitive space. Between their constant searching for a better deal and ever-decreasing attention spans, customers can be hard to retain. Plus, “customer loyalty” sounds like a phrase out of some nostalgic old film. Fortunately, e-commerce companies have a powerful tool at their service – learning to create a personalized shopping experience. Cookies, marketing automation tools, and analytics programs are making it possible to get the experience of shopping alongside a helpful salesperson at a brick-and-mortar store – all without leaving your home. E-commerce companies can learn their customers’ wants, needs, and preferences in order to create a smoother shopping experience and cross-sell additional items. According to Econsultancy, 74% of marketers say targeted personalization increases customer engagement, which can lead to increased sales, and a recent survey by E-tailing Group Inc. showed that 40% of consumers would prefer to buy from retailers that cater to their preferences. Yet many e-commerce companies have been slow to adopt personalization. Here are five ways you can get started today. When you walk into a department store, do you spend hours wandering the aisles until you find the right section, or do you scan the directory and head straight to the thing you want to buy? When a customer arrives on your e-commerce site, they do the same thing – clicking on the menu to go to the department they want. Customer experience optimization platforms allow you to gather information about the customer’s demographics and preferences, then adapt your website interface to show what they’re most likely to be looking for. Whether that’s highlighting your menswear to a male browser, or showing off your rain jackets to visitors from colder zipcodes. Don’t believe customer experience optimization works? Check out this study on how The Clymb used Optimizely to increase sales by 12%. How many marketing emails to you actually open? Not very many? Yeah – neither do your customers. Personalizing your email campaigns can increase your open and click through rates, and according to Experian Marketing Services, personalized emails generate up to 6 times higher revenue per email than do non-personalized emails. Customers know the emails are still automated, but if you can come up with a way to make them feel special? Gold! In another study, Experian found that birthday and anniversary emails had an especially high transaction rate when compared to standard bulk mailings – almost fives times for birthday mailings and six times for anniversary mailings. With only the click of a few automation buttons and collection of a little bit of data, you can send customers a specialized coupon or other gift they can actually use. Need inspiration? Check out this collection of personalized email campaigns on Hubspot. You hear it over and over again – consumers are more likely to buy a product a friend recommends over something they simply saw an ad for. If you have a fantastic product, it’s probable that customers are already raving about it. Thank them, and make their shopping experience a bit more personalized by rewarding them with discounts when they share your products on social media. 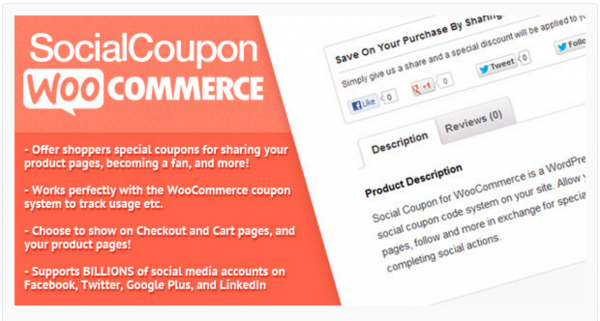 The Social Coupon plugin will automate that for you. When a customer shares a page as they shop, a coupon code is automatically added to their cart. This plugin works with the WooCommerce couponing system, and you can control where the sharing buttons appears on your WordPress website using shortcode. While some of these ideas involve already knowing information about your customer, it’s also possible to deliver personalization just in the moment. Action-based personalization is a responsive tool that changes what a customer sees on your website based on the actions she takes there, like adding or removing items from the shopping cart, viewing products, entering information, and answering surveys. The way you change your site to create a personalized shopping experience for your customers can include things like also-bought recommendations, links to relevant content, wish list or “buy later” list reminders, and automatically moving abandoned shopping cart items onto a wish list. The more data is gathered about the customer, the more personalized your e-commerce site will be – and the more your customer will start to feel like they’re getting a private concierge experience. Machine learning is the personalization of the future, according to this fantastic article on Shopify. It’s already being used in online courses and higher education to customize student learning paths, and – of course – behemoths like Amazon have been using algorithms to make recommendations and learn your shopping habits for years. The tools are still developing, but when they do e-commerce stores will be able to create a personalized shopping experience that is even more powerful – making even the biggest e-retailer feel like it knows the customer as well as a mom-and-pop shop. How do you create a personalized shopping experience for your online customers? Share your tips and ask any questions below!